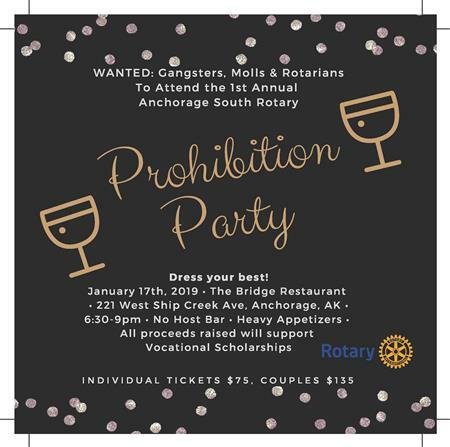 Rotarians, Gangsters, & Molls, you are invited to the Anchorage South Rotary prohibition party! A night of great food, dancing, drinks, and the best camaraderie in town. Dress in your best 20's themed outfit, and help support the ASR Memorial Fund. There is a no host bar with heavy appetizers provided, and a brown bag liquor auction for you to take something home. Tickets are available from your favorite Anchorage South Rotarian or online through brown paper tickets.